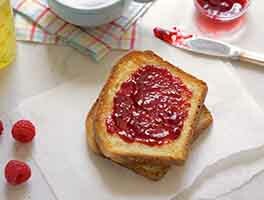 Take gluten-free yeast baking to new heights with this sourdough recipe for a favorite European breakfast tradition. 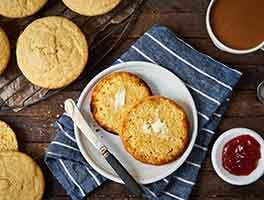 Complete with all the nooks and crannies, we think you'll find this tangy, chewy English muffin closer to the real thing than any other gluten-free version you've had on your table. 1 hrs 25 mins. to 2 hrs 30 mins. Add the dry ingredients to the starter and beat until well-blended. Add the water, oil, and egg to the mixture and beat on high speed for 2 to 3 minutes. The batter should resemble a thick paste. Cover the bowl and allow the batter to rise for 1 to 2 hours. It won't double in size, but will be noticeably puffy. 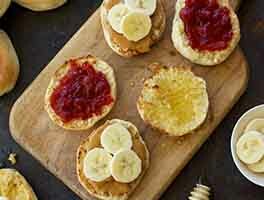 Preheat your electric or stove top griddle to a medium heat and lightly spray 6 English muffin rings with oil. You can sprinkle the surface of the griddle inside the rings with cornmeal if desired to help prevent sticking. When the griddle is hot, divide the batter among the rings; cook until the bottoms are set, then carefully remove the rings. Cook for 7 to 10 minutes on the first side, then flip over. Cook for another 7 to 10 minutes, or until the muffins reach an internal temperature of 210°F. Transfer to a rack to cool completely before cutting and/or freezing. Yield: 6 to 8 muffins. For storage, keep muffins in airtight container or freeze for prolonged shelf life. 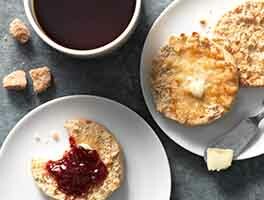 I was looking for a gluten-free recipe that didn't disappoint, and I found it in this English muffin recipe. I have been disappointed with all gluten free sourdough bread recipes I have tried, so I was pleasantly surprised as these muffins turned out so well. I didn't have potato starch or the other flour recommended, so just used King Arthur Measure for Measure flour. I used a griddle at 350 degrees and cooked each side for 10 minutes. They really puffed up nicely. I preheated the oven to 350 degrees and then baked them for an additional 15-20 minutes. While not as good as gluten muffins, these were lighter than the usual gluten-free sourdough breads I have made. Will definitely make these again. These are absolutely amazing! I made my own GF starter a few weeks ago and came across this recipe. Both my GF friends and non GF friends love these muffins. I invested in some muffin rings. I can't believe how delicious they are. After having to go gluten free, I would scour different stores trying to find GF English muffins. The were so-so. I'm so happy that I can make my own now. These have been a go-to breakfast recipe for me for quite a while now! 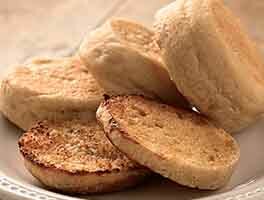 They taste good and feel like a real, gluten-filled english muffin. I too cook them on the stovetop/griddle for a few minutes on each side and then finish them in the oven. I freeze the majority and toast them up when I feel like having an english muffin. Only recently have I found store bought GF english muffins that compare, but I will continue to make my own as the sourdough does add a special something! 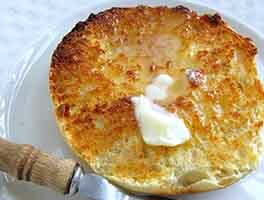 I tried this recipe the way the recommended, but found that my english muffins were burning, even when I turned down the heat I couldn't achieve the 210 temp without some burn. So today I attempted it by setting the muffins on each side then putting them in the oven to finish cooking, which is giving them a nice rise and fulfilling the done temp of 210. approximately 20- 25 mins cooking time. My oven runs 25* over though, so work with your environment and temp settings. I also added a bowl of water to help with humidity in the oven while baking. This recipe is excellent! I'm not sure what has caused the difficulties others have experienced, but it worked perfectly for me with a single adjustment: I keep them on the griddle for closer to 15 minutes per side, THEN cover them with a cake pan to steam for a few minutes. Overall time on the electric griddle is closer to 30-35 minutes at 350. Two batches have come out perfectly with no other alterations. This was one of my first baking attempts with my GF Sourdough starter (mostly fed with brown rice flour, and occasional dustings of tapioca starch and kombucha), and I can honestly say that these are superior to any store-bought English Muffins that we've ever had. Granted, I've never made homemade English Muffins with regular flour, but these are far and away better than anything I've purchased. This is an excellent recipe. This is the closest thing to an English Muffin that I have had since eating GF. I used my own starter made from Carl Griffith's 1847 Oregon Trail Sourdough Starter that I have been making gluten free by feeding it exclusively sorghum flour. I followed the recipe exactly by cooking on a slow cast iron griddle for 7 minutes on each side. I then baked them at 350 degrees until they each reached an internal temperature of 210. That way, I knew they would not be raw inside for sure. They are awesome fresh- -split open with a fork and they even have a little of that nook and cranny thing going on. Warm melted better, a little bit of tang from sourdough. Awesome! I definitely recommend freezing them as soon as they are cool, because I could tell as time went on they were getting drier- -Gluten Free foods are best eaten right out of the oven or frozen as soon as they are cooled to keep them fresh. They toast up great in toaster oven. Have extra sourdough? An easy recipe to use some of it up. I will be saving this one for one of my must-keep recipes. Loved these! We have celiac in our family, so I do a lot of gluten free cooking, and these were easy and delicious! I'm also at high altitude, so just a couple tips for any others at about 7000' - I dissolved my "active" (not instant) yeast in about 1/4c of (additional to the recipe) warm water. I cooked the first batch in the rings on a griddle, and all but the smallest muffins were a bit doughy. The next batch I cooked the same way but covered them under an upside down cake pan as they cooked on the griddle. They were perfect. I make these about once each week. After I grill them 7 minutes on each side, I place them in a 350 degree (F) oven on a cookie sheet on the middle rack of my oven and bake them until the internal temperature reaches 210 degrees, using a ThermoWorks Super-Fast Thermapen (bought at KAF). I check the internal temperature by taking the cookie sheet out of the oven and checking the internal temperature of each gluten-free English muffin. I place those whose internal temperature has reached 210 degrees on a cookie rack placed above a cookie sheet and let them cool. When they are cool, I use the BB's BEST Muffin Splitter (bought at KAF) to "cut" of "slice" each muffin in half. I place two of the "sliced" English muffins in a zip-lock quart baggie and place them in the freezer. When I want to enjoy one, I take the quart baggie out of the freezer, place it in the microwave oven until it's thawed (35 seconds to one minute), then toast the muffin halves in the toaster. Yum, yum, yum. Even people who are not GF enjoy these gems!